Everest region is certainly one of the most stunning mountain areas on earth. 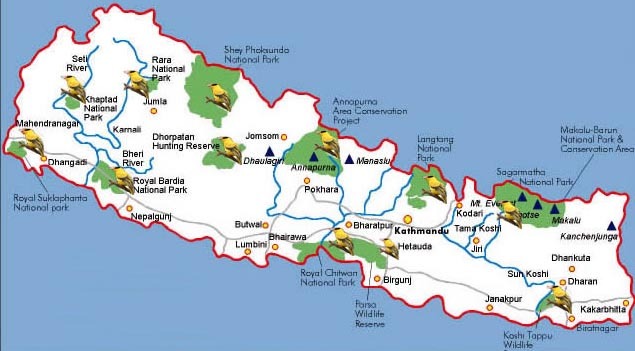 This short route enables trekkers who have a limited time to discover the most famous beauties of Nepal. Set amongst breath-taking high mountain scenery, the route heads through the Khumbu - Sherpa country. The trail to Gokyo is a gradual ascent up the valley passing through patches of birch and rhododendron forest where the elusive musk deer can sometimes be seen. Through small yak-grazing settlements, we reach the Gokyo lakes. The Gokyo Peak (5480 m) ascent is the one of the highlight of this circuit, we rest here to savor the incredible scenery, including magnificent views of Everest (8848 m), Makalu, Cho Oyo (8153 m) and Lhotse (8511m), to name but a few. The Renjo Pass route is off the usual beaten tracks. At the pass, a great vista of Gokyo lakes on one side and Rermo Pokhari lake on the other side, and the myriad snowy peaks in the background brings up a fascinating atmosphere. The route bis is much easier. From Gokyo, the trail descends along the opposite bank of the Dudh Koshi. Level of difficulty * * ,Maximum altitude: 5480 m, Best season: Spring and autumn. By plane then trek to Phakding (2600 m) in 3h. Great sight of the Kusum Kangru (6369 m). in 5 h. Beautiful view of the Tengpoche monastery and the verdant Phortse plateau on east. Stunning vistas of the Thamserku (6608 m) and Kang Taïga (6685 m) on southeast and the Taboche (6367 m) on northeast. in 5 h. A breathtaking 360 º view with Lhotse, Everest, Makalu, Cho Oyu, four of the fourteen 8000 m on earth, dominating the myriad lesser peaks. in 6 h. The trail takes the east side of the valley. All the way, it is a succession of ascents and descents along the Dudh Koshi. Tengpoche (3870 m) in 5 h. We follow a U shape trail, overlooking Pangboche, which shelters the most ancient monastery in the Khumbu. We follow on to Tengpoche monastery, situated in a glade surrounded by dwarf fir trees and rhododendrons, and considered as the main Buddhist center of Khumbu. 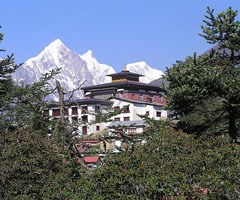 Up there, the panorama is breathtaking; Ama Dablam, Everest and Lhotse rise high above. in 4 h. We cross the Dudh Koshi river and retrace our steps to Namche Bazaar. This is a pleasant and easy walk, via a panoramic trail. Day 14: Lukla - Kathmandu by plane. Day 15: Kathmandu. Day at leisure. Safety day for your international flight. Day 16: Kathmandu. Hotel - airport transfer.